One last post from Goa, India. Bits and pieces, little vignettes, my family, and a tree I love. Clothes hanging on a line to dry. On one side, a barbed wire fence holds up the line. 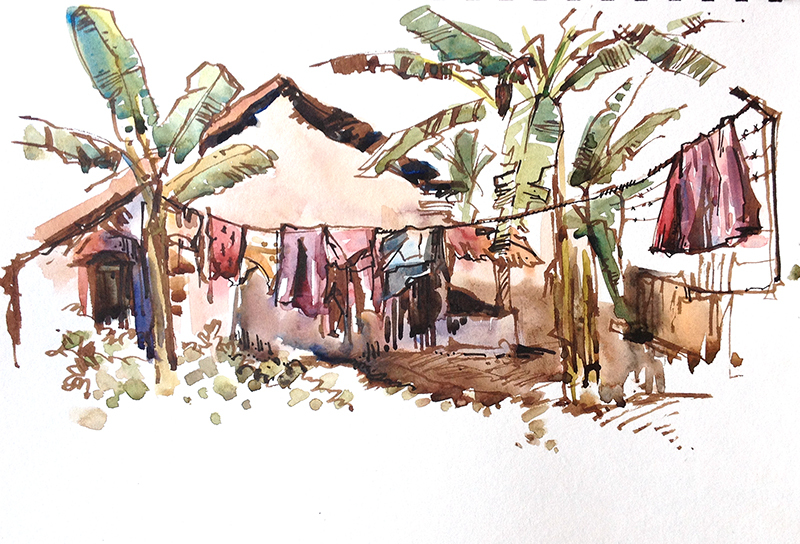 On the other, a banana tree. 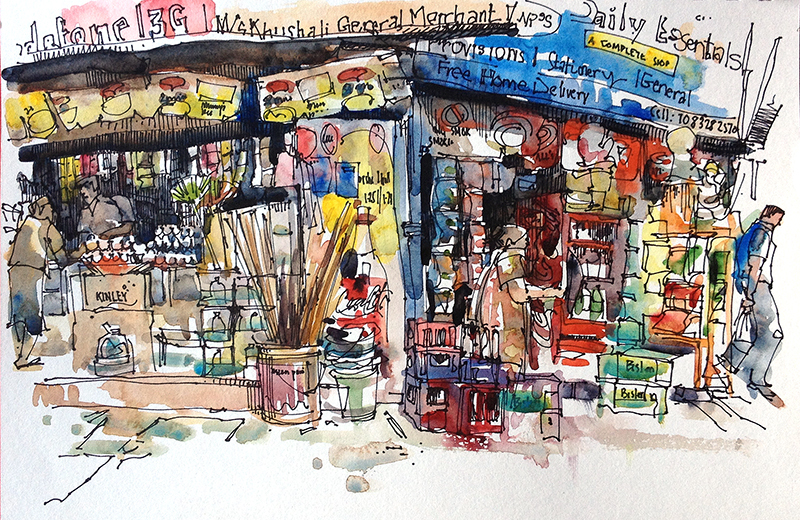 The corner store anywhere in India is an amazing thing: tiny, but packed full of stuff. You can walk in and request almost anything, and the storekeeper will magically find it for you. Wires crisscross the sky like someone took an exacto knife and slashed across the expanse of grey-blue. 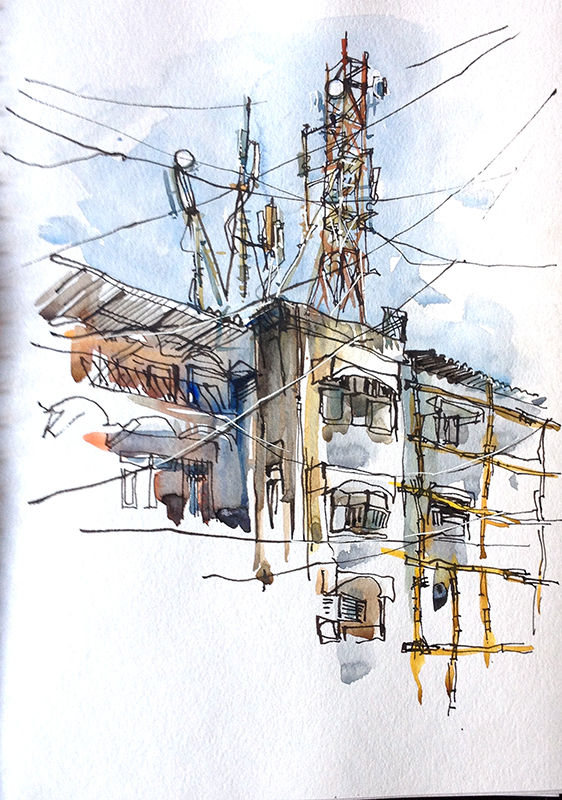 Radio towers, cellphone towers, bamboo scaffolding, crumbling buildings. This could be anywhere in urban India. Sketches of my family. 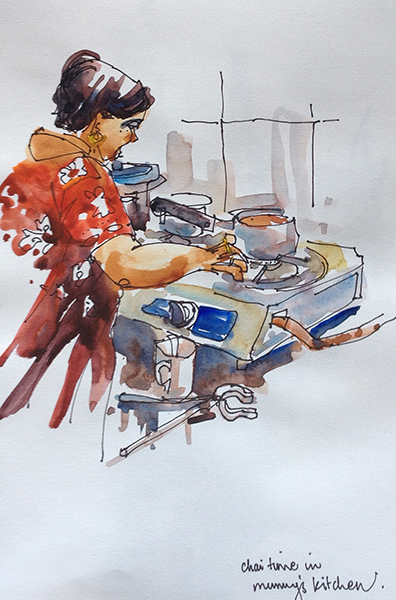 My mom making chai in the morning. And my dad doing his morning exercises. For 40+ years I’ve watched him do this same routine set, never skipping a day. 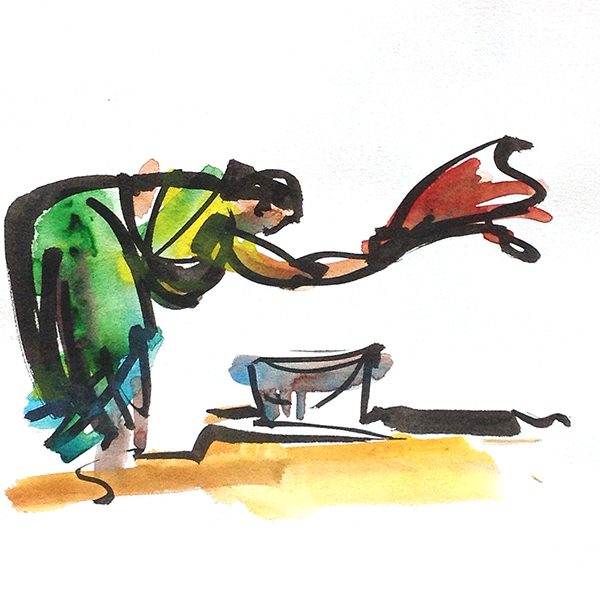 Quick little sketches: a woman washing clothes by beating them against a large, flat stone. Lighting a wood fire to start the day’s cooking. A dried palm frond is the kindling. 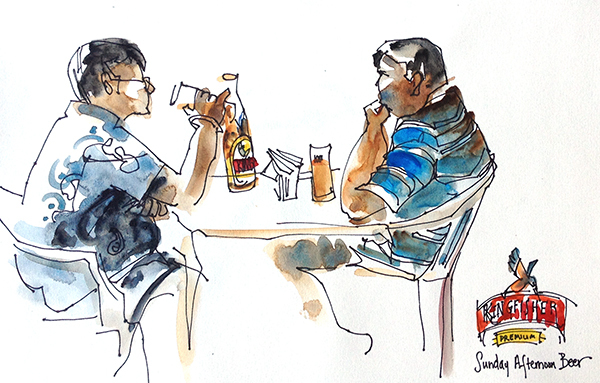 A hot Sunday afternoon spent with a bottle of ice cold Kingfisher Beer. 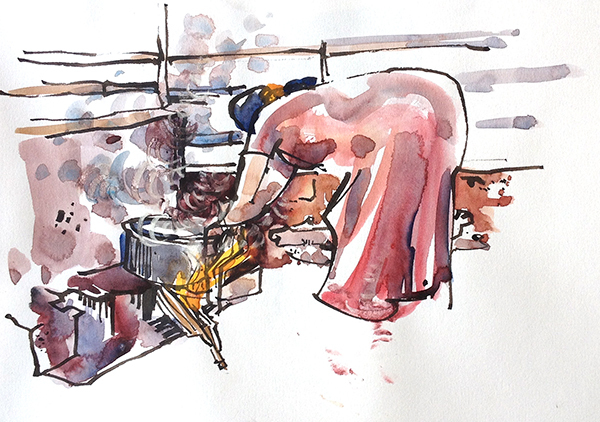 And my very last sketch from India. A gulmohar tree in bloom. The flowers range from egg yolk yellow, to California poppy orange to fiery red. Those strange things under it? Giant spools of electric cables to be laid underground. 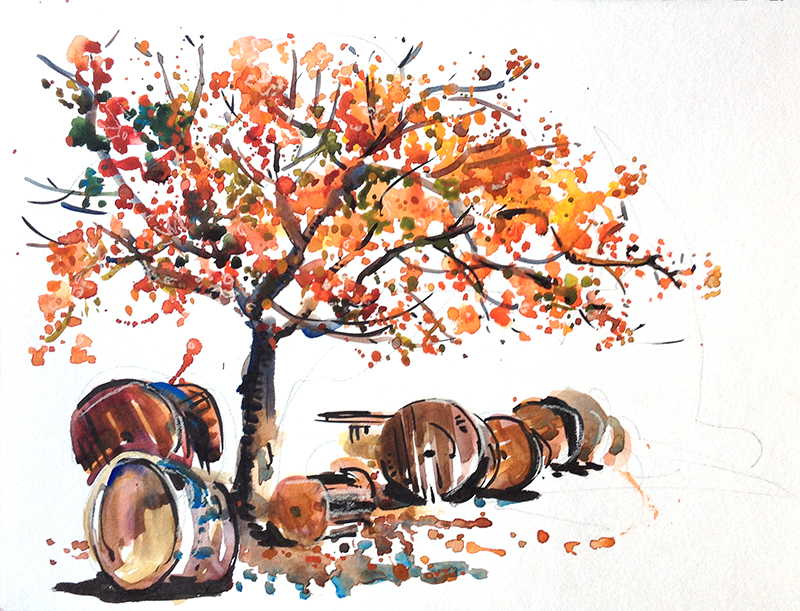 I’ve been back from India for a long time now, but posting my sketches over the weeks is a little like extending my trip and reliving the experience. Thanks for coming along for the trip. 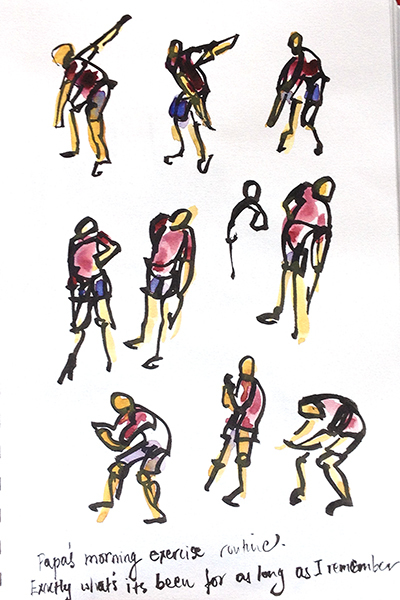 All my sketches from the trip, including many that didn’t make it to the blog, here on flickr.